The London Mountaineering Club owns a club hut, called Fronwydyr. It is located in the Snowdonia National Park near Llanberis, in North Wales. 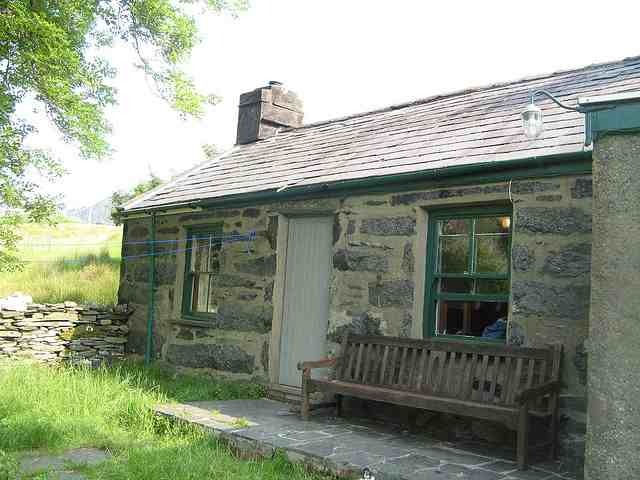 It sleeps 16 people, has three bedrooms, a living room, a kitchen, a drying room and showers. It is available to members and their guests via the club's Hut Bookings Secretary at extremely reasonable rates. The hut is available for hire by BMC affiliated groups/clubs/organisations. The minimum booking by an outside group is for 6 spaces, and the maximum is 12. The four loft spaces are always reserved for LMC members when an outside club has booked the hut. It's also possible for a group of LMC members to book all 16 spaces in Fronwydyr. For all hut bookings, please contact the Hut Booking Secretary. The Hut User Guidance document provides information about the hut's facilities, access, things to do on arrival and departure, and other practical details. We recommend you refer to it if you have booked a stay at Fronwydyr. Fronwydyr (grid reference: 606587) is located in the village of Nant Peris. If using a sat-nav, drive to LL55 4UN and then then hut is another 100 metres on on the left. You can either take the M1 or M40 out of London to join the M6 northbound. If taking the M40, turn off at the M42 Junction 3A (northbound), to join the M6 northbound. From the M6, after passing Birmingham, turn onto the M54 at junction 10A towards Telford. The M54 will end and become the A5. From the start of the A5, follow this for 78 miles/125 km, passing Llangollen, Corwen and Betws-y-coed to get to Capel Curig. At Capel Curig, turn left onto the A4086 (passing the Plas-y-Brenin outdoor centre). 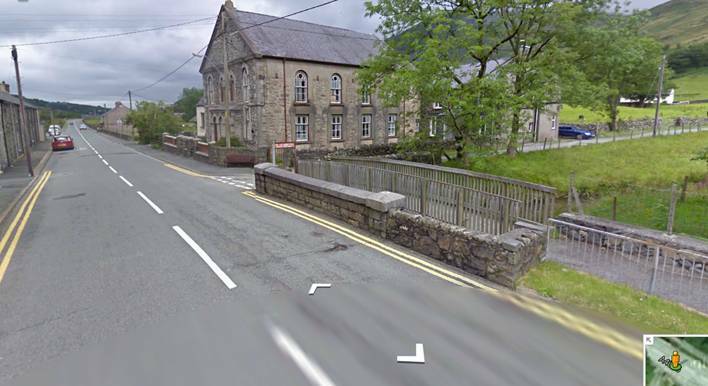 4.5 miles/7 km from Capel Curig, you will see a small building on the right. This is the famous Pen-y-Gwryd hotel. Turn right at the hotel and travel for 4.5 miles/7 km into Nant Peris (passing the Pen-y-Pass YHA on the way). 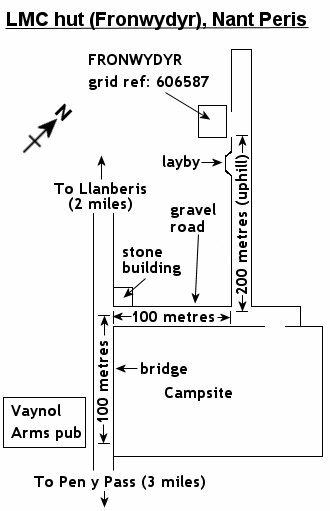 The only pub in Nant Peris is the Vaynol Arms (refer to map below). Opposite the pub is a campsite. There is a right turn on to a narrow gravel road 100 metres after the pub (with a stone building on the corner). Another 100 metres up the gravel road, you will get to a junction. Straight ahead takes you to the campsite or turn left towards Fronwydyr. After turning left, travel uphill for 200 metres, passing a few buildings on the left. You will finally get to a gate on the left, marked "Fronwydyr"
Fronwydyr has parking space for about 6 cars. Please note that Fronwydyr has very poor mobile reception, so don't rely on being able to ring up for directions. A view from the road of the turning up towards the hut. Cross the little bridge and turn right before the building.